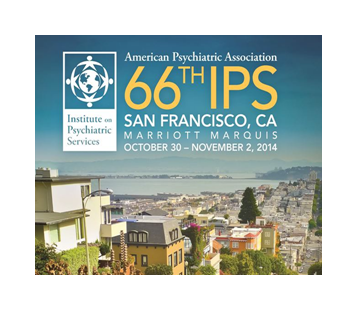 The Institute for Psychiatric Services, the American Psychiatric Association’s smaller and more collegial educational program, is coming to San Francisco next week. 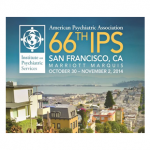 The meeting will be in San Francisco’s Moscone Center from Thursday through Sunday and promises to be a not to miss educational and social program for clinicians with an interest in treating major depression, bipolar, and other serious mental illnesses. The Institute is going to be here over Halloween and there are a number of social events that should really give attendees a cultural experience as well. Below, I have highlighted a few of the presentations that give you a taste of the conference. The program itself involves hundreds of posters, presentations, symposia, etcetera. For more information follow this link to the registration and information page on the American Psychiatric Association’s website. 1:30 p.m. – 3:00 p.m. • Pacific Suite J, Fourth Floor. Media Forum: Voices – A Documentary Film about Human and Untold Stories of Psychosis. Voices features the stark and intimate portraits of three very different individuals and their struggle with severe mental illness in America. The stories of Sharon, Thomas and Aaron illuminate the challenges, realities, and often complex emotions and choices that surround people with psychotic mental illness and those who love them. 2:00 p.m. – 5:00 p.m. • Sierra Suite B, Fifth Floor. Media Forum: Here One Day – A Film About Bipolar Disorder and Suicide. Here One Day is a beautiful, emotionally candid film about a woman coping with mental illness, her relationships with her family, and the ripple effects of her suicide on those she loved. 10:00 a.m. – 11:30 a.m. Pacific Suite H, Fourth Floor. From Couch to Camera: The Reflections of an Activist Psychiatrist. APA John Fryer Award Lecture. Lecturer: Dee Mosbacher, M.D., Ph.D.
8:00 a.m. – 12:00 p.m. Yerba Buena Salons 3/4, Lower Level B2. Recovery-Oriented Care in Psychiatry. American Association of Community Psychiatrists. Chairs: Wesley E. Sowers, M.D., Annelle Primm, M.D., M.P.H.. Faculty: Jacquelyn Pettis, M.S.N., R.N. 2:00 p.m. – 5:00 p.m. Sierra Suite A, Fifth Floor. Working Psychotherapeutically With People Who Hear Voices: Cross- Cultural and Narrative Perspectives. 3:30 p.m. – 5:00 p.m. Pacific Suite H, Fourth Floor. Latest Developments in the Assessment and Treatment of Disability in Severe Mental Illness. APF Alexander Gralnick Award for Research in Schizophrenia. Lecturer: Philip D. Harvey, Ph.D.